Triplex apartment with mountain views and Ski-In/Ski-Out. Lovely Spa in residence. We can't really complain about anything. Nice and professional welcome, spacious apartments, kitchen fully equipped. Everything worked. Two remarks though: there were lot's of stairs. This might cause problems for some. Bring your own stuff to start the open fire. The wood provided was to big to get started.Two more remarks: don't rent at INTERSPORT. The choice and quality of skis was disappointing. Skis from last season, choice of boots very limited. The skiing school was great. Excellent instructors. 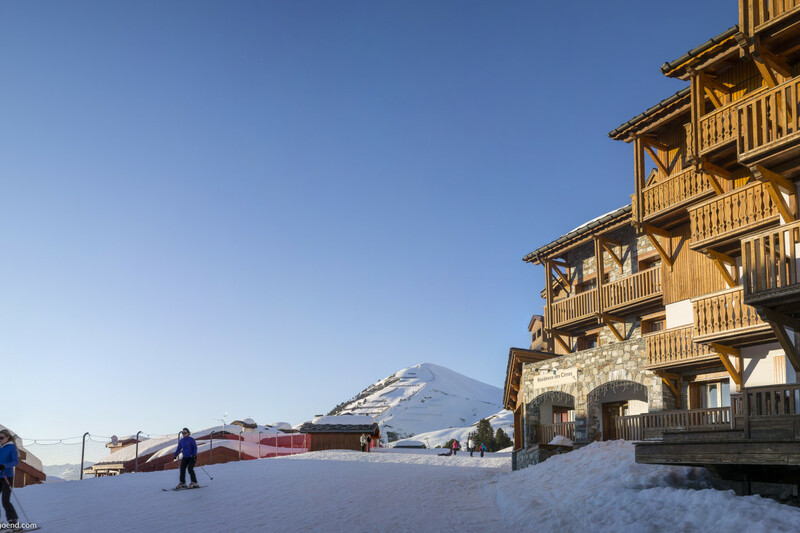 The location is great with just a 20m walk to the slopes which leads direct to Bellecote chairs. Skiing back is a little more tricky either by a button tow at the top of Belle Plagne town centre or from either the l'arpette or la bauchettes chairs and follow the signs in. Once you worked it out it was easy and meant you could ski to about 20m from the door via a little stairwell. The apartment was spacious well laid out. Furniture and fixings in great condition and of good quality. Pleasant bedrooms, semi comfortable beds and pillows for a ski chalet, great ski in, ski out. Bad points - you can hear everything from neighbouring chalet, such a small social space and kitchen for a chalet that sleep 8 and unfortunately the apartment was not maintained well, the shower doors had come off the runners, when we attempted to close the door it shattered over my husband and 2 year old (who was inside the shower) cutting them both. The Chalet admin took 48 hours to clear the glass from inside the shower and the drains that it had blocked, and that was after pushing them, they initially handed us a hoover! "Great 4 bedroom Apartment in a Great location"
We booked this as a family chalet. The apartment itself was exactly what we wanted. Two twin rooms at the top floor with a bathroom for the kids. Middle floor for kitchen lounge and diner and lower floor for Adults with a ensuite bathrooms and separate shared WC. The apartment itself was clean and spacious but a little on the tired side but nothing to complain about. Ski locker for the end of the day and step outside the front door and you are on the piste. Its location is superb. The drag lift at the side takes you up to behind the property to get you back to the front door so NO lugging skis. Spar for food and the shops are all very close. Change of towels mid week is a nice touch along with a little washing up and dishwasher pack. However: Make sure you bring coffee and filter papers, dishwasher tablets, kitchen towels etc as these are very expensive. Also bring a couple of black bin bags. You get one on arrival then have to buy another 50 from the Spar! I asked for one but got a Non :-( But this is THE MOST IMPORTANT thing you need to know. The private parking roof is VERY low and at two points my standard roof box scrapped along the roof. Either don't have one or bring a tyre inflater, let your tyres down passed the roof and pump up again on departure. Luckily mine is old and tatty so I wasn't to upset. Oh and if you are driving get a motorway pass in advance its brilliant to sail passed all the queues. Hope you found this useful, happy to answer questions.